Do you have dozens of drafts languishing on your blog or on your computer? I sometimes hear from other bloggers who say they just don’t think their posts are good enough. Maybe they’ve written a few paragraphs before fizzling out. Maybe they’ve already written a full post, but it’s missing… something. Are you holding off because you’re a perfectionist? Although research shows that perfectionists actually procrastinate less than other people do, since blogs don’t have deadlines, it’s easy to dilly-dally. You can always make something better. Me, I am definitely not a perfectionist. I’m generally happy if I get 80% of the way to where I want to go. But I know what it’s like to hold a post back because I’m not sure if I’m expressing myself clearly enough. As I write this, there are nineteen drafts in my WordPress interface and countless more on my computer. The oldest draft I have in WordPress is from February 2014. Come to think of it, the time for that topic has passed. Eighteen drafts now. Do you want to know something that works better than drafting posts? In Lean Startup, there’s this idea of a “Minimum Viable Product” – the smallest thing you can build so that you can test your business assumptions and get feedback from real customers. You can use this in writing, too. Instead of finely crafting and endlessly polishing each blog post, I write a blog post that I’m reasonably–not completely, just reasonably–happy with. I schedule it a few weeks out. You can do that from the WordPress edit screen – click on Edit near Publish immediately and change it to the date you want. It’s even easier with the Editorial Calendar plugin, which lets you spread posts over weeks. So then I have this imperfect post that will be published even if I forget about it. My mind keeps working on it in the meantime. (Now that I’ve learned about the Zeigarnik effect, I see it everywhere.) Sometimes I come up with a thought I’d like to add. 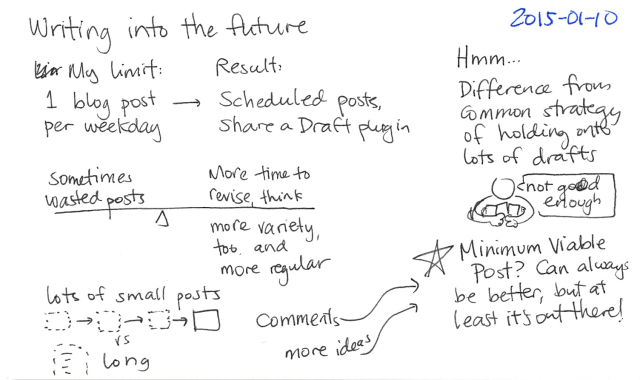 I might share a scheduled post using the Share a Draft plugin. Maybe I’ll re-read the post and find a typo to fix or a gap to fill. And hey, even if it isn’t the height of perfection when it finally gets published, at least it’s out there. Then people can tell me what they found interesting or ask questions about what they didn’t understand. You don’t get that feedback if your thoughts are stuck in your drafts. What if you turned out to be completely wrong about something? At least you learned you were wrong. What if you skipped over some things that you could have explained? Let someone ask questions and pull that information from you. Write (and schedule!) 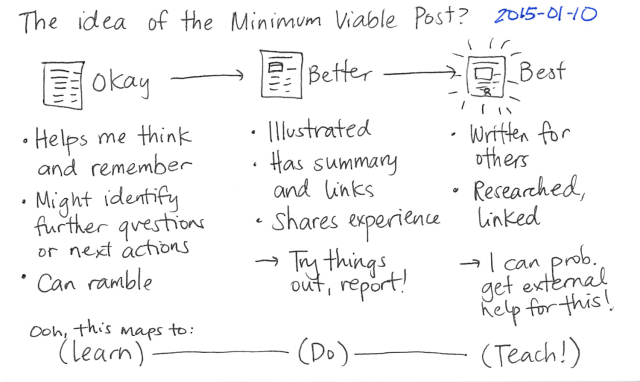 minimum viable posts: the simplest, roughest cut of your ideas that will move you towards learning. You can treat the schedule as your new deadline for improving the post. Resist the temptation to reschedule posts again and again. If the deadline is here and you still can’t quite settle on your post, publish it as is. Then listen to your dissatisfaction for clues to how you can improve the next post. Get stuff out there. Good luck!